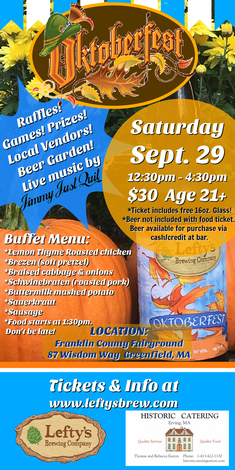 > Events in Massachusetts > Lefty's Brewing Oktoberfest! Celebrate Oktoberfest, Lefty's style! Tons of beer on tap (and wine too! ), awesome raffles, live music by local favorites: Jimmy Just Quit, local vendors, & fun free game tournaments with prizes! We'll be featuring a huge & delicious menu from Historic Catering to fill yer bellies, while you eat, drink, & be merry! Food served at 1pm - DONT BE LATE! $30. Age 21+ Only. NO PETS. *Beer is additional. We accept cash/credit at the beer garden. We offer free water to everyone and a free 16oz Lefty's glass! ADVANCED RESERVATIONS REQUIRED. No tickets sold at gate. Free Game SIGN UP 12:30pm. PRESALE TICKETS ONLY! NO TICKETS SOLD AT THE GATE! * Seating is limited, reserve asap! * Event is handicap accessible, all on level ground with large bathrooms. * There is a pavilion for shade while eating. * FREE PARKING across the street from entry gate! * The festival is RAIN or SHINE. * The festival grounds has credit card access for purchases with cash back options. Cash is preferred please! * Pets & minors are not allowed. 21+ ONLY. Must show I.D. to enter. * Beer Bar & Raffle/Merchandise Booth take cash & credit. Cash preferred please! * Management reserves the right to check all purses. NO backpacks. No coolers, NO chairs, NO tents structures. * NO outside glassware, food, beverages, or alcohol. Water, beer & wine will be available for purchase. * Management reserves the right to remove any individuals without refund for intoxication, fighting, or inappropriate behavior towards our staff, guests, or fest materials. * We reserve the right to not provide any winning materials/prizes to those exhibiting inappropriate behavior/stealing/harrassment towards our staff or others. * We have the right to confiscate your glass if you've already been told you will no longer be served. * All drink items listed on the “Drink Menu” are subject to change and some styles of beverages will run out before others. * Beware of “driving while intoxicated laws” and plan accordingly. Please drink responsibly. Please pre-arrange for a taxi or sober ride home. Please arrange for a safe ride in advance. *One complimentary 16oz glass per customer included with entry fee. If you break your glass or want more, you can buy another for $5. Supplies are limited, first come, first serve. * There are no ticket refunds. There is no re-entry into the fest. Bring your cell phone, $, I.D., jacket, sunglasses, etc - We repeat: THERE IS NO RE-ENTRY! * PRESALE TICKETS ONLY. NO TICKETS WILL BE SOLD AT THE GATE!